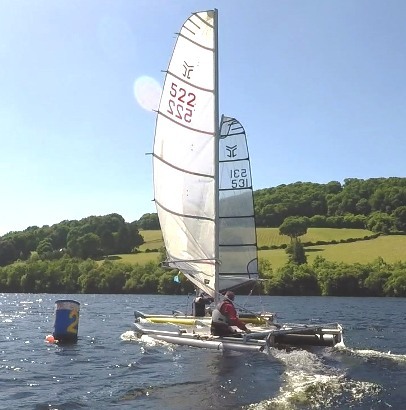 Catapult was back to Bala Sailing Club for the 2018 Nationals, again sharing the event with the Tinker Tramps Inland Championships (two long-established sailing classes, with inflatable technology for lightness and convenience, and close racing.) Well-organized racing let the two contrasting fleets (and the club fleet on Sunday) share the starting line and first short beat, the Tinkers then taking different courses to manage a 4-fold speed difference. The high pressure clamped over the UK gave consistent bright sunshine and (unusually for Bala) an easterly breeze, staying light, and twisted coming down the Dee Valley to ENE-NE. Off the land at the top of the lake, the breeze fluctuated wildly as the day went on, strengthening but still having lulls and gusts (Photo below). It swung 20-30 degrees at times, (usually too unpredictably allow tacking with the shifts) and places could change abruptly, a stern test of character. The club helpfully agreed to port-rounding triangles suiting the boats, with two reaches and a beat. 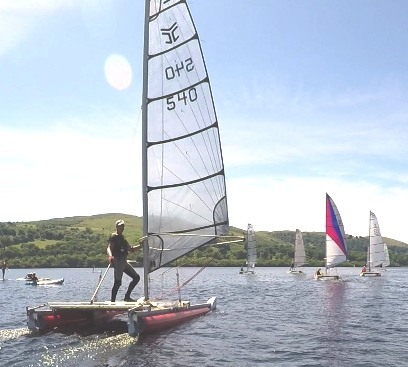 An on-wind start meant a very short beat to the top mark, with the tactical challenge of trying to lay the mark in one starboard board from the line, risking being stuck in a lull close to shore. In Race 1 Paul Ellis was away well showing great boat speed on his return to racing, opening out a big lead. On the beat back up, John and Gareth established a lead over the chasing pack, and on lap 2 tacked immediately left after rounding the bottom mark, catching Paul who had carried on towards the shore out right. On lap 3, on the tight reach to the bottom mark, Paul and Gareth left John trailing in their wake as they caught a huge gust whilst John sat in a hole.However, this time John tacked immediately after rounding, whilst Gareth and Paul headed out right, and gained the lead, held round lap 4 until the final beat to the finish. All three opted to tack immediately after rounding, and John and Paul got headed, while Gareth got lucky with a lifting gust, to climb to windward and overtake John. Being closer into shore continued to pay off for Gareth and he held the lead to the finish, with John second and Paul third. Race two followed after lunch, on the same course, with the wind increased overall, mainly through occasional gusts. Alastair's good start gave him a small lead, but he was caught on the third leg by John T, and then by Gareth who pulled away from the fleet to build a large lead which he held to the finish. Paul Ellis again came through into third, until on the third lap a gain from a lift gave Alastair a narrow third over him. A good start in Race three following back to back gave Paul an early lead, then thrown away missing the gate on lap 1, doubling back and handing Gareth the lead, chased by John T.
On the beat to the gate on lap 2 John caught a good patch of wind threatening Gareth, sitting in a wind hole. Fortunately for Gareth the wind returned just in time and he extended his lead again on lap 3. Sunday came with the lake glassy at 9am and it looked as though the boats sailing up the lake from the Pant-yr-Onnen campsite for the racing would be marooned, but as in the previous two days it filled in gradually, becoming gusty, and the racing got underway briskly with the same challenges. 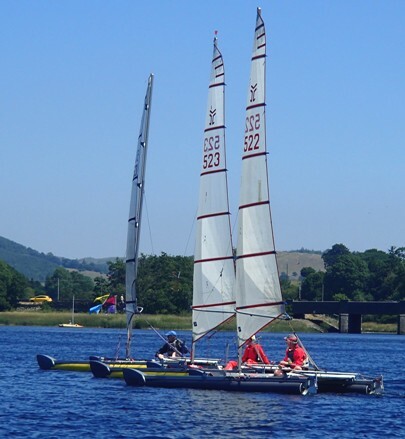 For Race four, the course was extended down the lake, for a longer beat, but the long lulls meant that only two long laps were possible, and the longer fetch to the bottom mark did not give any more stability to the shifting breeze. From a good start, Alastair gained a short lead, but was caught at the downwind mark by Gareth and John T, and trapped behind them at the turn, tacked immediately going out wide left,suffering a fatal wind-shift putting him to the back. The fleet tightened up downwind, with Mike gently running onto Stuart's stern for a 360 turn.In a tense last beat to the finish, Gareth just managed to prevent John overtaking to windward. In one last attempt, John ducked below Gareth's stern to overtake to leeward but didn't have the necessary speed so Gareth hung on for the win. Behind, Stuart took another third place, pushed by John Peperell. In race five following back-to-back, the leg from the start to the top mark was tight and some boats put in a short port board only to see the breeze free and let the rest of round ahead. The fleet stayed tight down the reaching legs, and then Alastair and Mike held on out towards the shore out to the right, being gifted a big lift and gain. Mike consolidated this and joined Paul and Gareth to form the lead group at the windward mark. Gareth managed to overtake Paul on the reach to the bottom mark for a slim lead, extended on lap 2 for the win. On the next beat Mike climbed to second by again going left to the shore, and despite his mainsheet getting caught on a kayaker's paddle at the gybe mark (!) held off John Terry for a good second place as the chasing pack closed in. 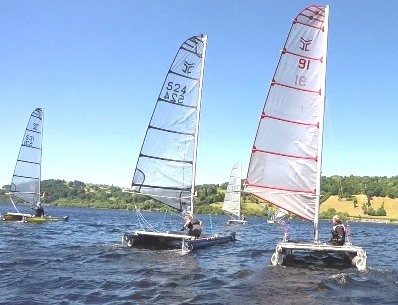 The final race of the 2018 Nationals followed after lunch. Gareth, able to count five straight wins, was a clear 2018 Champion, and he could afford to miss Race six to rescue his new lawn in the drought. Mike and Nigel picked that the breeze had shifted slightly further north, and flew across the fleet from a port end start, with a very quick tack to round ahead of the mass on starboard, with a good gain. Again the fleet shifted places in the shifting breeze on the upwind legs, but John T came firmly through to the lead. Behind him Alastair grabbed a good lift to catch Paul but was caught again, and then crossed a boat-length ahead of Stuart for the third, with Syd following them in fifth.